and speaking of, i found some bloggers who knit it! and a curled stockinette (in my opinion) is more interesting to look at…. 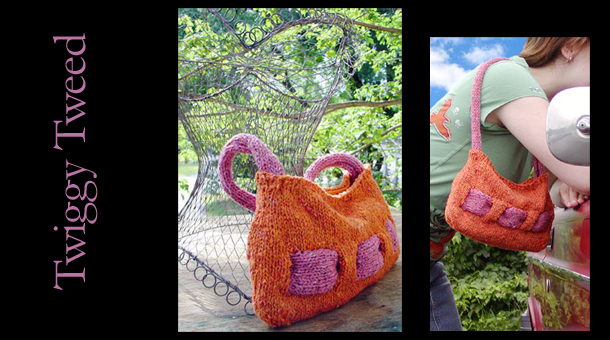 a little more on the design of tiggy tweed… i wanted to make something fun to knit… sure, it’s not totally practical as a purse, but i’ve been using mine on occasion to cart around my phone and wallet while shopping… not an everyday bag of course… the construction is really a blast, i even saw someone who did a felted version! Thanks so much for the mention! I really dug the pattern, so much that I cast on for another one right away. Sadly, I don’t think I got any piccies before it was gifted as a going away present, but she loved it, too! i absolutely love this bag – i plan on making a bunch. 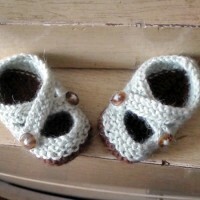 i am somewhat of a beginner (i know my way around my neeedles and am tired of scarves) but i have a goofy question about your pattern and googling and craftster arent helping… so – how do i “break off yarn”?? is it just cut and tie in a knot? (in the body of the bag to weave the contrast in) how do i do that? thanks so very much for helping my goofy self! hey! I found your blog while searching around the internet for more info about twiggy tweed. i knit one but am starting construction and its just turning out awful, so i figured who better to ask than the person who wrote the pattern! It’s coming out very flat, similar to this knitter’s, http://www.flickr.com/photos/jaceycraft/2307001777/in/set-72157602760958033/, like windows, instead of squishy like yours! Should I try knitting the CC strip larger? Re-knit the body with slits instead of holes? Am I just not getting how to seam it probably? 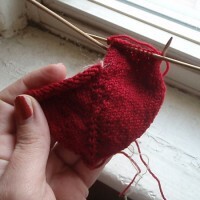 (Which is my worst thing as a knitter, I should have thought about that before starting when I realized how much seaming was involved). Find a new thicker yarn (used Lion Brand Wool Ease)? Its sort of weird to ask on a comment to clarify the pattern, but I really want a purse like the picture. Thank you sooo much.